Weavers of traditional ancestral designs argue the Guatemalan government has a responsibility to protect their Mayan culture from outside exploitation. Indigenous women in Guatemala are fighting for collective intellectual property rights over their traditional Mayan textiles in the face of a lack of government will to protect the cultural heritage that represents thousands of years of Indigenous community resistance, Mayan organizations argued in court on Tuesday. “What we want is a law to protect our textiles because it is something that is ours, we learned from our grandparents how to weave,” said Kaqchikel weaver Marta Puac, one of dozens of women from different communities who went to the Constitutional Court in Guatemala City on Tuesday in support of the initiative. The case, led by a group of women from the community of San Juan Sacatepequez northwest of Guatemala City—with the support of an association of Mayan lawyers—calls on the court to push Congress to introduce new laws specifically aimed at protecting Mayan cultural patrimony and and intellectual property. Puac explained that the women fear that in the future their textiles could be subject to a patent from outside their community that would effectively rob Mayan people of their designs and culture. “We’re defending our identity,” she said. In the hearing, representative Angelina Aspuac argued that the Guatemalan government uses Mayan culture as a selling point for tourism without taking steps to protect the communities’ collective rights over what she describes as a kind of living culture. She also argued that there is a question of labor rights at stake since it is Indigenous women who weave the iconic textiles while others reap the majority of the economic benefits. Another Indigenous activist, Josefina Con Cuc, explained that the case seeks a “guarantee” that Mayan people can continue carrying forward the cultural heritage of their designs to future generations. According to the women behind the initiatives, the lack of state action to recognize collective rights to traditional textiles goes hand-in-hand with other threats to their cultural protection, including increasing industrial production, commercialization of culture and unfair market access for Indigenous women. The women hope the case will also help them increase their incomes and see more equality in labor relations involving intermediaries, who may be less able to exploit their work with intellectual property rights in place. 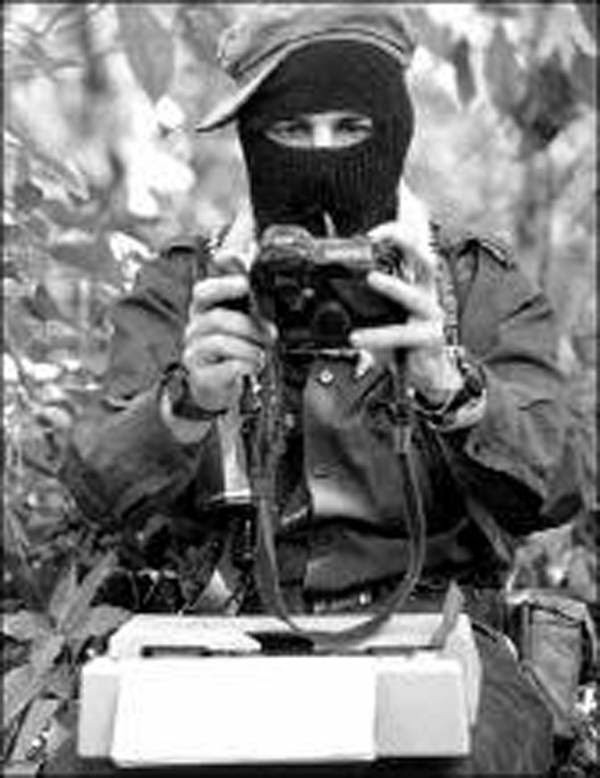 This article is about Guatemala, however its content is equally relevant to the Maya of Chiapas and perhaps especially to the Zapatista communities. HUAJUAPAN DE LEÓN- Salvador Olmo García, a 27-year old vendor, community journalist, activist, defender of lands, vocalist and pioneer of the anarko-punk movement in Huajuapan, was found seriously injured this Sunday morning in the Las Huertas neighborhood of the city. Around 4:40 this morning, rescue workers of the National Emergency Commission (CNE) were alerted by local police agents that that there was a seriously wounded person at an unnumbered building on Naranjos Street, so Ambulance 06 of District 020 was immediately dispatched to the spot. When the paramedics arrived, they saw someone lying by the side of the road. They immediately gave him first aid and put him on a stretcher. When they noted that he had serious wounds on his arms, legs, head and torso, they decided to take him to the Emergency Room at the Pilar Sánchez Villavicencio General Hospital of Huajuapan, so he could get the necessary medical care. After trying for several minutes to save his life, however, the medics reported that Chava, as he was known by his family and friends, had breathed his last due to the presence and accumulation of outdoor or pulmonary air in the chest cavity (pneumothorax), a fracture of the right arm and a broken nose. After the death of Salvador, who was also a reporter for the Tuun Ñuu Savi community radio, fellow broadcasters accused local police agents of being both the perpetrators and the masterminds of this crime. They said that Chava had previously been arrested and then run over by an official police vehicle. The reporters also demanded a speedy investigation to determine exactly what happened and punishment for the responsible parties. They warned that if these demands are not met, alternative measures will be taken to see that justice is done for this and other acts that they consider fascist and oppressive by uniformed policemen. Salvador Olmo García had been struggling for 15 years in defense of Mixteca lands and communities and against the exploitation of natural resources and the granting of concessions to foreign mining companies by government authorities. After this terrible attack, dozens of friends, acquaintances and family members gathered at the Tuun Ñuu Savi radio station to show their support and demand that the responsible parties be punished. “He was a good man with the soul of a child, with his black t-shirts, dreadlocks and boots. This was the only space he found where he could freely grow and develop,” said one of the activists who was a close comrade of Salvador’s. Our rage cannot be contained by police bullets, by the State’s jails, by the media’s lies. Our dead will not be forgotten, their combative spirit has spread so that we may take justice into our hands. Nochixtlán and Oaxaca resisted as the Isthmus region has resisted, demonstrating to the powerful that we don’t fear them, that we will confront them, we will defeat them; in the cold Mixteca the frontline has not been neglected. In spite of the pain that invades the people, they know the worst way to remember those who died in battle is to abandon the war. To remove a blockade and its barricades incites them to place more closures, more people in the avenues, highways, towns and in the struggle. The regions remain alert, the solidarity shows us that the struggle lives. The attempted State occupation by federal forces only heightens the tension and revives the rebellion. The State sends winks and nods to the teachers union after the massacre; the media applauds, we condemn it. We don’t trust in any dialogue with the authorities, especially now that the CNTE has managed to agree to one, after a brutal massacre of people who acted in solidarity with them and supported them. The blood of our dead cannot be negotiated with for reform, not even for the removal of politicians from ministries and governments. Nor will we allow for audacious politicians to hop on the tragedy. The resignations, the appearances, the support from these individuals – now – does not remove the betrayals already committed and those that they surely have planned. Organization by community, neighbourhood, groups and relationships is necessary in order to block the opportunism and leadership that those sick from power so crave. The battle against the State should happen on all fronts. The street is ours but we have to win on the media and ideological fronts, to strengthen the resistance, to organize the rage, to spread and expand the revolt is the way; and not just in Oaxaca – which is filled with marches, barricades and protests – but elsewhere. Conflict is necessary, the placid peace of the State must be interrupted. The siege by federal forces gathered in several positions should be acknowledged, the arrival of more reinforcements is a reality and the objective is clear: the pacification by force of the Oaxacan people. But we will not give up, we have learned that repression should not provoke fear, to the contrary it should nourish our highest ideal: freedom. Here’s the doubt: what would be the most appropriate comparison for that sad and mediocre overseer who aspires to be a policeman? We think that given his thirst for blood and his cowardice, the latter fits him best. And, just like in the television series “Game of Thrones,” where Ramsay Bolton is devoured by the dogs that he before used to attack others, the paid media that have used Nuño to slander, threaten, and attack the teachers in resistance and the communities and organizations in solidarity, will feed on him when he falls. To him and the entire system he serves. Since May 15 of this year, the teachers in opposition declared a labour strike, closing a large part of schools, with percentages above 95% in the states of Chiapas and Oaxaca. Adding to the strike, teachers organized marches, blocked roads, held encampments and symbolic “sit-ins” of city councils and radio stations, among other actions, which have received growing support from the parents of the families of students, as well as the general population. The teachers currently maintain an encampment in the downtown center of the city of Oaxaca de Juárez, which is being guarded by barricades in the historic center of town and by road blockades of strategic points to prevent the entry of police forces. It isn’t simply another of the many Oaxaca wars. It is part of a much deeper and wider war, which isn’t even contained in the national territory. But the battle being waged in Oaxaca has special significance in that war, in the great war. It is a long announced battle. In Oaxaca it was known that they were postponing many aspects of the ongoing confrontation until after the elections. It was clear that after the elections the blows, provocations, final assault would worsen. They began preparations everywhere. On June 14, all Oaxaca was remembering. It was a remembrance against the forgetting: today’s scenario seemed to be a faithful mirror of 10 years ago. We were seeing a rerun of the same movie: the teacher mobilization, the sit-in the zócalo, the marches, the teachers’ demands, a fierce media campaign … And the authorities again betting, as then, on Section 22 getting exhausted; on growing citizen irritation; on the people’s fear of violence and loss of income and jobs. The June 14 march that arrived at Oaxaca City’s zócalo expressed residual experience. For nearly 10 hours, alongside the teachers in their encampment, many diverse sectors creatively expressed the ways in which today memory inspires action. Oaxaca’s civil society spoke out with conviction for the necessity of learning from 2006, “not only to close a cycle that left us full of wounds and pains but to open new stages of struggle that we might not make the same mistakes and that we might absorb the positive teachings of the movement. On that day they began to blockade the roads. In Nochixtlán and on the Isthmus of Tehuantepec, the people took to the street to close passage to truckloads of militarized police heading to Oaxaca City. Aircraft began arriving at the Oaxaca Airport. Many thousands of people, from all sectors of society, encouraged and supported the blockades, and they began to weave social solidarity. Oaxaca is burning. There is clear awareness of the moment of danger. Therefore, from every corner, an appeal is sent out today for courage—both the courage that expresses moral outrage shared by a growing number of people and the courage that means valour, integrity and the ability to walk with dignity and clarity in these dark times. The battle has just begun.